Areography: Geographical Strategies of Species discusses the hypotheses and results of areography, which is the study of geographical range of species. 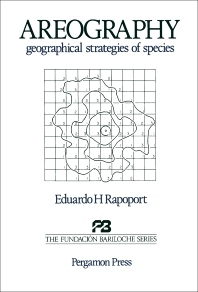 The book consists of six chapters, which help demonstrates that the geographical range of species can be studied and can help provide a methodology to analyze the spatio-geographic strategies of species. The first chapter provides an introductory discussion on areography; the chapter also covers several issues, concerns, and criticisms on areography. Chapter 2 discusses the anatomy and morphology of areas, while Chapter 3 covers the methodological approaches. The fourth chapter tackles the concept of barriers. Chapters 5 and 6 discuss geographical and ecological areography, respectively. The text will be of great use to researchers who are involved or have an interest in areography.